President Barack Obama attended the dedication of the Edward M. Kennedy Institute for the United States Senate on Monday in Boston. President Obama on Tuesday doubled the number of commutations he has granted as president when he shortened the sentences of 22 people imprisoned for drug-related crimes. The commutations barely budged Obama’s overall clemency rates, which are the lowest of any president in decades, far lower even than law-and-order presidents like Nixon, Ford and Reagan. Obama has pardoned 3.4 percent of all petitioners who have sought one and shortened the sentences of 0.3 percent of inmates who sought a commutation. 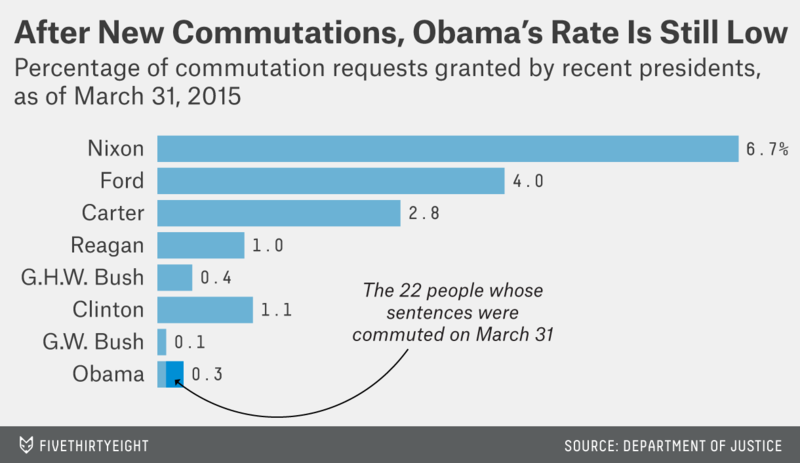 Obama’s commutation rate was on par with that of George W. Bush before Tuesday’s announcement and exceeds it slightly now. So, is Obama just less merciful than his predecessors? 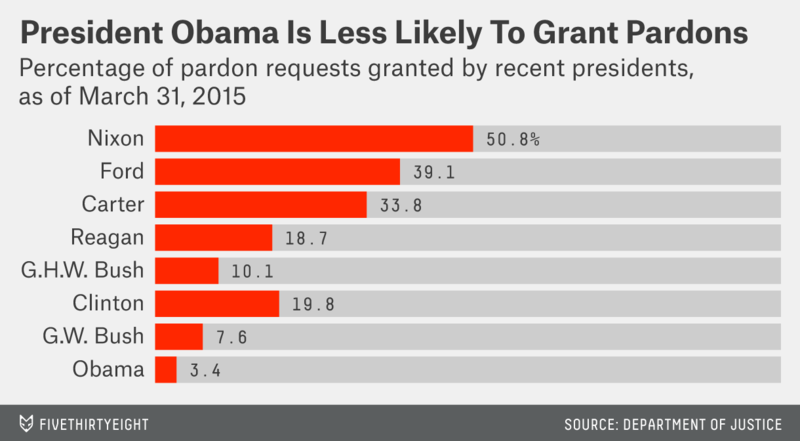 Obama’s low pardon rate may be mostly the effect of his own choices, but his low commutation rate is partially the result of a surge in petitions. Requests spiked in fiscal year 2014, when Obama received 6,561 petitions for commutations, 3.5 times as many as he had averaged in all preceding fiscal years (1,851). The surge is continuing; only five months into fiscal year 2015, Obama has already received 1,311 petitions. The surge is probably driven by two policy reforms. In 2014, the Department of Justice changed its guidelines for clemency, expanding eligibility, particularly for prisoners who would receive a “substantially lower sentence” if they were convicted of their crimes today. Paired with the Fair Sentencing Act of 2010, which reduced the racially tinged sentencing disparity between possession of crack and powder cocaine, the shift by Justice triggered a major expansion of prisoners eligible for clemency. Because Obama faces so many petitions, he would need to grant 182 commutations to match Clinton’s 1.1 percent rate even if he received no new requests for the rest of his term. That would be nearly as many commutations as were granted by all presidents from Nixon to George W. Bush (199). But Obama’s rate may continue to rise. He has made it clear in recent interviews that he is serious about changing the treatment of nonviolent drug crimes in the U.S. and now appears willing to use his constitutional powers to that end.